July 20, 2017 July 20, 2017 Your Life As Art Essentials - Pamela McLellan-ZmijaLeave a Comment on Thursday BOGO! Passion Touch and Console Touch or Lavender FREE! Thursday BOGO! Passion Touch and Console Touch or Lavender FREE! 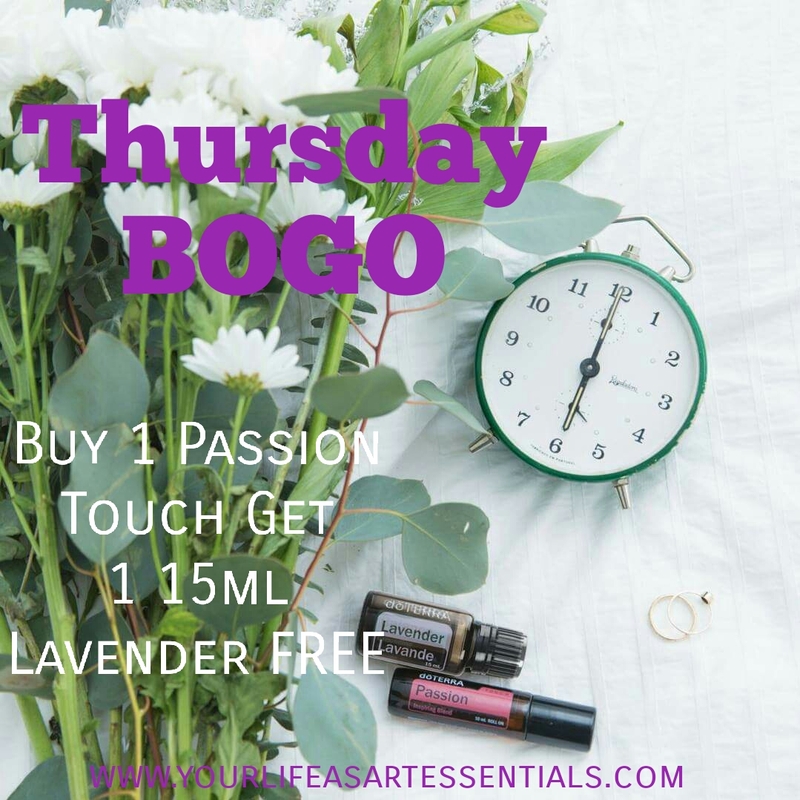 Thursday BOGO! These are AMAZING! As Canadians we have the opportunity for BOTH BOGO’S! I love my Touch rollers and Lavender!!! From the Canada Warehouse, buy a 10 mL Passion Touch (CA SKU 60200713) and get a 15mL Lavender FREE. From the US Warehouse, buy a 10mL Passion Touch (US SKU 60200150) and get a 10 mL Console Touch FREE. BOGO only available while supplies last! ❤️Diffuse in the morning to start the day feeling energized and enthusiastic. ❤️Apply to pulse points and heart throughout the day to feel inspired and passionate. ❤️Diffuse at work to spark creativity, clarity, and wonder. ❤️Have you lost your why, your mojo, your passion? 🆓 Used in Aromatherapy as a nervine and calmative. 🆓 Used in Aromatherapy to help relieve colds and coughs. 🆓 Used in aromatherapy to help relieve joint/ muscle pain associated with sprain/strain/ rheumatoid arthritis. 🆓 Used in Aromatherapy to help relieve headache. You can order wholesale! Want to purchase a Kit with FREE Wholesale Pricing and ADD ON BOGOS go to http://www.mydoterra.com/pamelazmija to get started now! 🙂 Select the Join & Save option! Be sure to select shopping local (Canadian Warehouse BOGO) Or NFR Unites States Warehouse to get the US BOGO! Or Contact me to be included in my Group Order to save on daily shipping! Be a part of my exclusive group for education, support, hints and tips! Join my exclusive group now! Check out my group throughout the day for more helpful tips, hints and uses on all of these amazing products!! !